Greetings to you from Rhonda! 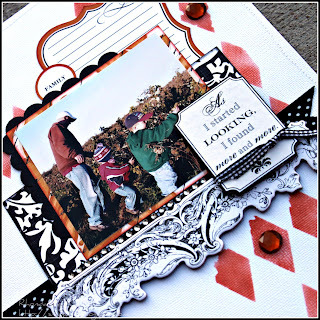 I am so excited to host this week’s challenge today on the blog! Do you ever find certain styles of scrapping so attractive, but you never attempt them? I always love the clean and crisp look of a page with white space. For some reason I struggle a bit with that style, so that is what I decided to focus this challenge on. Are you ready? 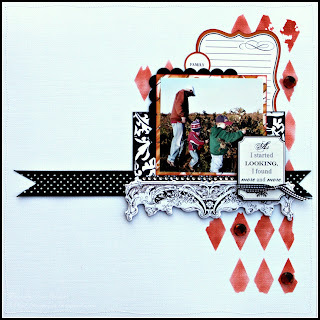 Here is what I created using the October Club Q kit featuring the “Giving Thanks” line by Teresa Collins. I started with this fun harlequin shape template and my Mango Mai Tai Chalk Ink and created the diamond pattern. I layered the elements using the pre-cut laser pieces from the kit for my layers under the photo and for the scalloped photo corner. The harlequin pattern was first masked using a template and the Mango Mai Tai PowderPuff Chalk Ink. I added a little bling and ribbon for some texture and just played around with the layers a bit. I’ve created a sketch from my project for you if it inspires you. This challenge is about how you use white space on your project. 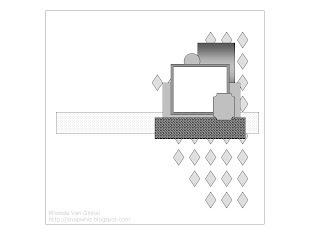 Create your own design or you are welcome to use the sketch. We can’t wait to see how you take on “White Space”!!! Love this 'white space' challenge! I personally struggle with this type as well. Even though I love when other people do it, I have a hard time leaving empty space on my pages - lol. Thanks for the great sketch! i love your layout Rhonda, beautiful !!! What a stunning page, Rhonda! I can't tell from this example that you have difficulty with this type of layout, in fact, quite the opposite! I would think you a master at it as your design doesn't seem at all clumsy or uncomfortable. I, too, have issues with leaving so much blank space on my layouts, though I really like how it looks. I'll definitely have a go at this challenge! Thanks so much for the beautiful inspiration. Thanks for the inspiration Rhonda and you do not struggle with this technique! Your layout is wonderful! I wasn't able to view the 2 entries from the CK website and then Ida's also wouldn't load :( Sorry for not being able to comment on them all.